This story that swept into Harley Quinn continuity like a hurricane is over after this issue, so perhaps the damage will be minimal. Or perhaps this story actually bolsters the character somehow! 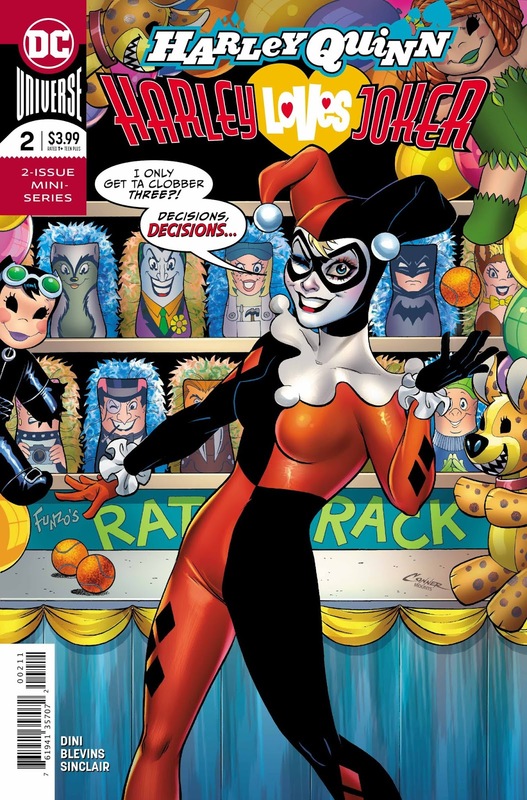 Only one way to find out: by reading my review of Harley Quinn: Harley Loves Joker #2, which is conveniently linked below! So uh, now that Grison has joined Team Joker, Harley Quinn is in therapy…with herself. She’s in her mind, I assume, being observed by her prior identity, Doctor Harleen Quinzell, and she can also conjure up her mother and other members of Harley’s life from time to time. Harley’s mom here, incidentally, does not resemble the tittering mom from Conner and Palmiotti’s Harley Quinn series, where Harley had two parents and a couple of ne’er-do-well brothers. But the story will address that, somewhat, later on. 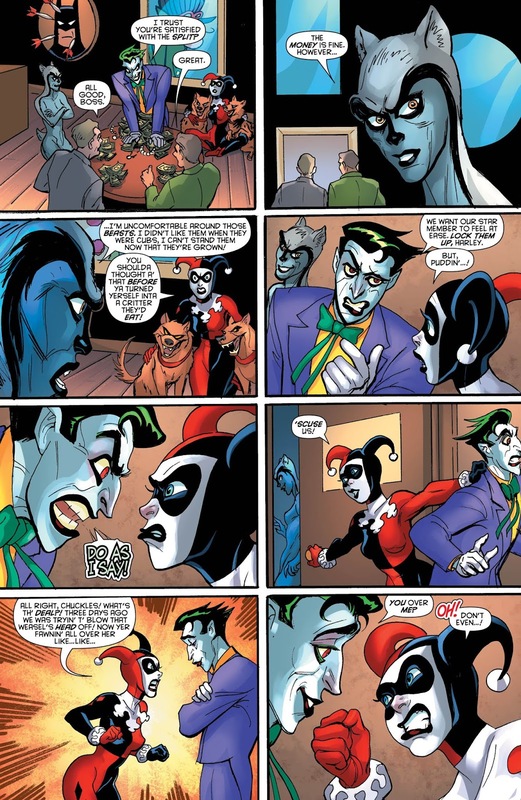 Thing is, Harley Quinn is jealous, despite her relationship with Joker being more than a little abusive, something Dr. Quinzell is quick to point out. But Harley just can’t quit that grinning clown. 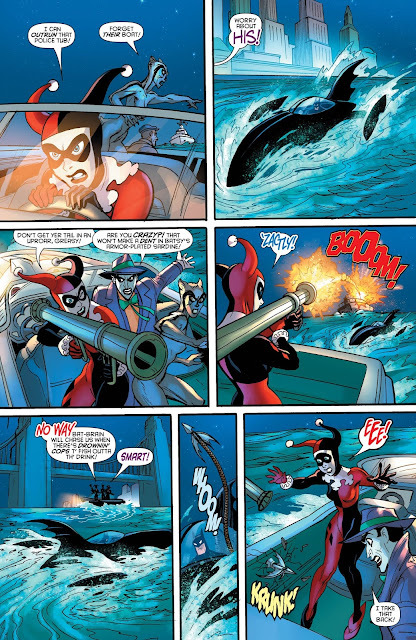 As they arrange another caper, Harley plots against Grison and the Joker by diming them out to Alfred—the plan is to steal a super ray gun from WayneTech, incidentally. Alfred knows it is Harley calling, but he does his due diligence and alerts Batman before the deal goes down. 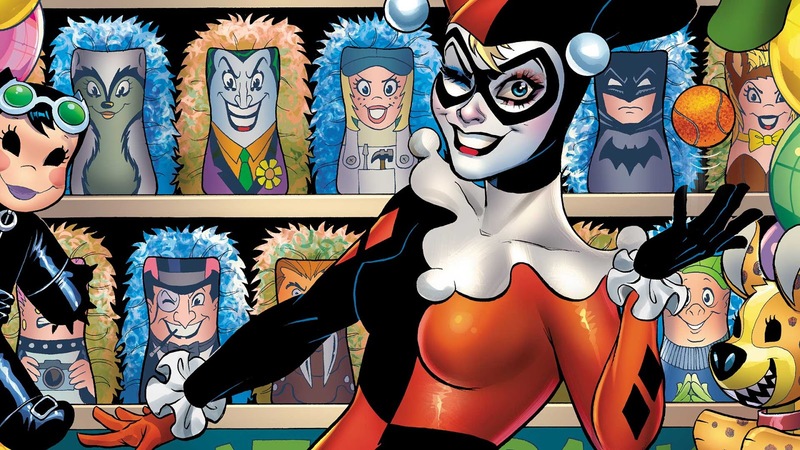 Just then, Harley has another internal therapy session and Dr. Quinzell turns into—modern Harley Quinn! Meaning the Amanda Conner and Jimmy Palmiotti version, with a little Margot Robbie thrown in for good measure. 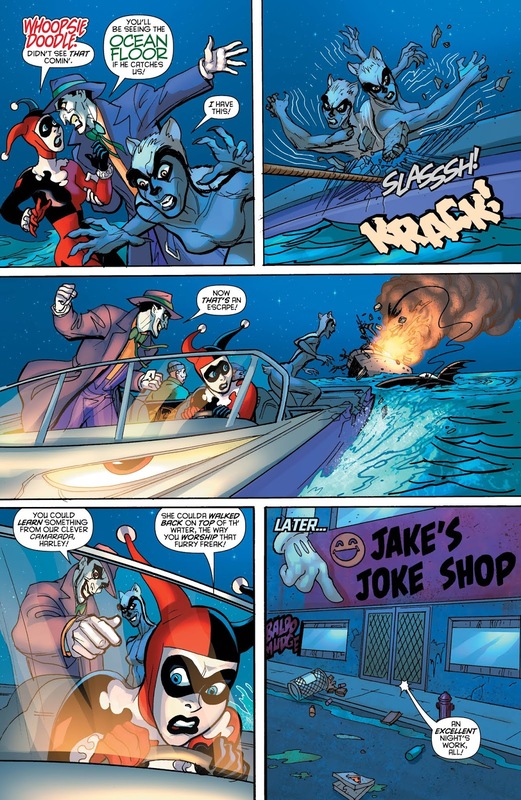 This Neo-Quinn chastises Classic Quinn for not being independent, and Original Flavor Harley starts to turn…when she suddenly realizes that this whole thing is a trap set by the Joker to take down the Grison! Over at WayneTech, that’s exactly what Joker tries to do, but the Grison is too alert for him: she traps him in a ludicrously tight web of laser beams that threaten to kill him if the Joker budges an inch. Harley saves him with some acrobatics, then chases Grison away with the help of her trained Hyenas. When Grison gets to the roof, Batman accosts her, and Harley and Joker flee the scene before the cops show up. 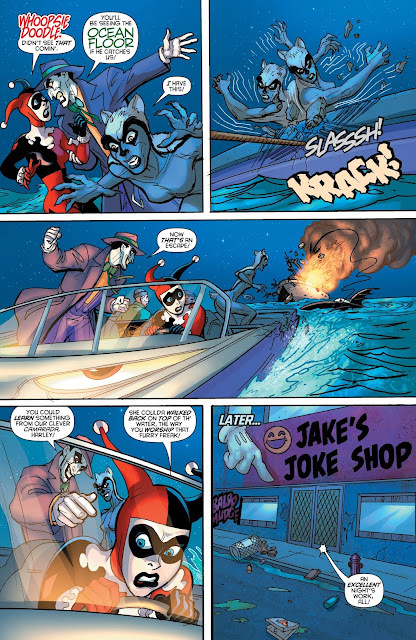 Joker knows something funny has happened here, but owning to the normally chaotic bent on his life, he brushes it off, blithely strolling into the new lair set up by Harley Quinn, and for which payment is due…today! Check out the issue to find out how it all wraps up! I am left with one question after reading this two-issue miniseries: why? Why does this exist? Why was it slotted into the regular run of Harley Quinn, though the character bears no resemblance to what we’ve gotten for six or so years? This thing reads like a lost two-part episode of Batman: The Animated Series, and it probably wouldn’t be the most fondly remembered. Bret Blevins does a terrific job porting Bruce Timm’s style to the printed page, except when Modern Harley Quinn shows up—this looks terrible! I don’t know what happened here, but New Quinn looks like a wet dog in this. Only Dini completists and Harley Quinn sycophants need to seek this two-parter out—and then you’d still need the six or so back-ups that appeared in Harley Quinn last year to set this story up. The whole thing feels like a pile of bricks falling down a flight of stairs in the dark. More of DC Comics clutching at straws. This two-part-plus-six-backups length story concludes and...that's nice, I suppose? I still don't get why this was part of the regular Harley Quinn run, or why it was commissioned in the first place. Fans of The Animated Series might enjoy this "lost episode," but fans of the modern Harley Quinn will be left scratching their heads. And even those that remember the cartoon fondly won't be thrilled here.